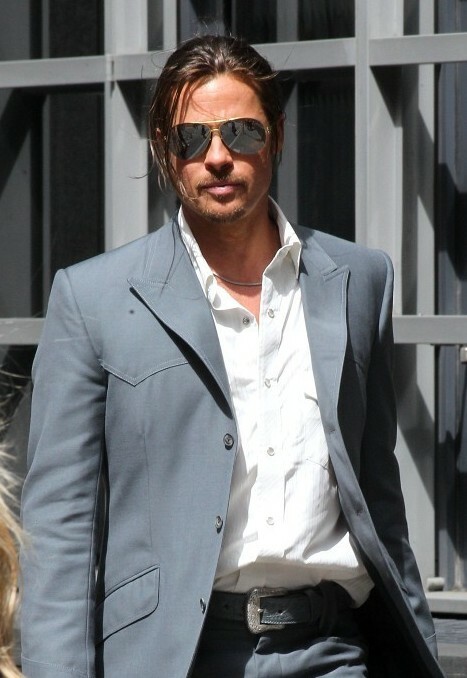 Here is Brad Pitt’s latest daily hairstyle, he wears long hair at present, as you know that he love medium and long hair very much, he wears his long hair up into a stylish ponytail, and leaves long bangs in the front. After a good 16 years in fashion hibernation, men’s ponytails are back in vogue. Browse through any of the current fashion magazines, and you’ll see what I mean. Just like Brad Pitt here, he also sports a stylish ponytail. The male ponytail, which was once a symbol of rebellion, is now nothing but the feeble, trendy fashion statement of the cool, the swanky, and the boutique clerk. Any one who wear long hair can try this stylish ponytail, and you will look awesome!